The good news? US GDP rose 3.5% QoQ, even though Personal Consumption was lower than expected at 3.6% and lower than September’s growth. The bad news? New home sales fell 8.9% MoM in October. New home sales declined 12% YoY, tied for the worst reading since 2011. Yes, the housing market nationally remains in the doldrums. 1-unit detached housing starts in October declined 1.82% (and -2.6% YoY). But 5+ multifamily starts rebounded 6.19% MoM. Rising costs and interest rates combined with the relative disappearance of subprime borrowers has led to a slowing in both single-unit and multifamily starts. According to the National Association of Realtors, existing home sales for June declined for the third straight month. What is unusual is that it is April, May and June. The year 2013 saw six straight months of declining home sales, but that was August 2013 through February 2014 (post peak season). June is typically the peak in a year for existing homes sales and median price. For a few years now, I have been employing lumber prices as a leading indicator for what the homebuilding sector of the stock market would do, and it has worked pretty well. But lately the correlation is broken, with housing stock prices falling even as lumber said they were supposed to continue trending higher. So it’s time to reevaluate the hypothesis about lumber giving a leading indication. In the past, I have found that a lag time of just over a year worked to show how the HGX’s movements tended to match the earlier ones in lumber. That is the correlation which has broken down recently. So I decided to see if perhaps the lag time had changed, or perhaps something else is going on. Playing around with different lag times, I came up with this week’s chart shown above. It features a lag time of only 55 trading days, which is about 2-1/2 months. For most of the period shown in this chart, this relationship seems to work, although the alignments of the highs and lows in each plot are not perfect. Sometimes it seems like a longer lag time would work better, sometimes a shorter one. 55 trading days seems to get the best overall fit. That is, up until February 2018, when the relationship breaks down. That was the point for the HGX plot that is equivalent to when lumber futures prices went up above $450, and that seems to be what “broke” the correlation. Will Higher Mortgage Rates Kill the Housing Market? 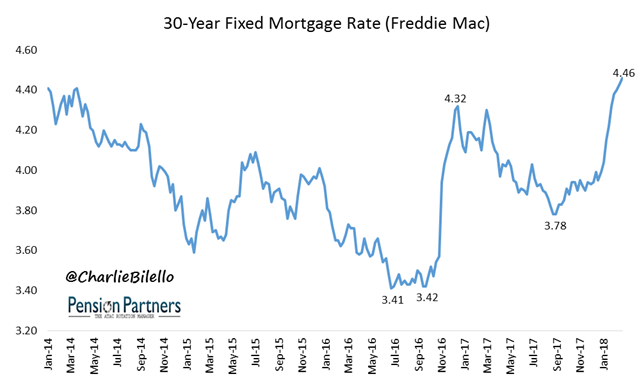 U.S. Mortgage Rates have risen for 9 consecutive weeks, hitting their highest levels since January 2014. That certainly seems like a sharp increase, but is 4.46% high? Only when compared to recent history, which includes the all-time low in yields from November 2012 (3.31%). In a historical context, mortgage rates today are still quite low. How low? Lower than 85% of monthly data points going back to 1971. The median 30-year Mortgage Rate over that time: 7.70%. Continue reading Will Higher Mortgage Rates Kill the Housing Market? There is an interesting event coming to Washington DC — the 2018 Housing Wealth in Retirement Symposium brought to you by The Funding Longevity Task Force at The American College of Financial Services and the Bipartisan Policy Center (BPC). The goal? The goal for the Symposium is to facilitate collaboration among stakeholders – including regulatory agencies, NGOs, and the financial services community – to address the under-utilization of housing wealth in retirement. The speaker list is excellent. The Urban Institute’s Laurie Goodman is the apparent headliner. Here are my two cents (which has been devalued to less than a cent). The American population is aging and many are entering retirement. But are they prepared? First, The Federal government and its stakeholders have already tried to get more households to be stakeholders (that is, homeowners). And this happened. Yes, the great leap forward in home ownership ultimately failed after almost reaching 70% before subsiding back to around 64%. That is, trying to get marginal households to switch from renting to owning. (By lowering credit standards and down payment requirements).